Most people know more about their cars than they do about the roof on their home or business. repair when compared to buying a new roof. 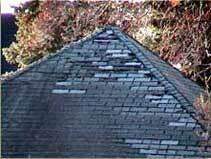 Don't let your roof look like this! What every homeowner should know is their roof is simple to maintain and the life of their roof can easily be controlled by a regular maintenance program. Because your roof represents a very sizeable investment and it protects your family and your home, you want a professional roofing company to meet all your roofing needs. That's Williams Roofing. At Williams Roofing we realize the importance of regularly scheduled roofing maintenance. It can extend the life of your roof and save you substantial sums of money as it helps you to continue to provide your homes best coverage. Call Williams Roofing today and ask us about our maintenance service.